After the Taika Reform in 645, Japanese government placed kokufu, or local governments, throughout Japan. The name of Dozen. Dochu and Dogo came from this history. Dochu was the region where the local capital was located and Dozen was the region closer to Kyoto than Dochu. Then Dogo was the remote region. Therefore, in the Middle Ages, Dogo was a general term for southern area of the current Imabari city. After the Early Modern Times, the name of Dogo became to mean the current area which has the famous hot springs. 다이카개신(645년)에 따라 각국에 국부가 설치 되어, 이 국부를 중심으로 도젠(道前)・도츄(道中)・도고(道後)의 명칭이 생겼습니다. 도츄는 국부지역을 일컫는데, 도시를 향해서 국부의 앞부분에 해당하는 곳을 도젠, 뒷부분에 해당하는 곳을 도고라고 부른 것입니다. 따라서, 중세의 도고는 현재 이마바리시보다 남쪽을 총칭한 것인데, 근대에 들어서는 온천이 솟는 지금의 도고에 한정하게 되었습니다. The legend of white heron is that a white heron which injured a leg found hot water splashing from a gap of rocks, and came there to soak the leg into the spring every day. After that the injured leg had been completely healed and the heron flew away. Farmers who saw it wondered and they tried to bathe the onsen. They found themselves relaxing and feeling well and even sick people got better soon. As a result people began to use the hot springs. This place called Sagidani was said to be near to the present Dogo area. 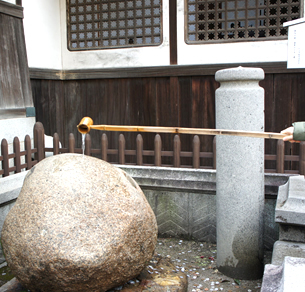 In later years residents put a stone named Sagiishi here to commemorate the legend. 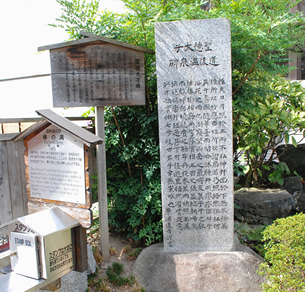 The stone was moved and is now kept at Hojoen Park in front of Dogo onsen station. 백로의 전설은 발에 상처를 입고 괴로워하던 한마리의 백로가 바위틈에서 솟아나오는 온천을 발견하고, 매일 날아와 그 속에 발을 담갔더니 상처가 완치되어 건강하게 날아갔다는 것입니다. 이를 본 사람들은 매우 신기하게 생각하여, 목욕하면 상쾌하고 피로를 회복할 수도 있으며, 또 환자도 어느새 완쾌한 것으로 활발히 이용되게 되었습니다. 이 사기타니란 곳은 지금의 도고온천에 가까운 땅이었다고 알려져, 후세의 사람들이 이 전설을 기념하기 위해 사기이시라는 돌을 여기에 두었습니다만 현재 도고온천역의 방생원으로 옮겨져 보존하고 있습니다. In Iyo-no-kuni fudoki or Iyo topographical records, there is a legend about two deities named Okuninushi-no-mikoto and Sukunahiko-no-mikoto. In the records, the deity of Okuninushi tried to save Sukunahiko who fell critically ill. So he brought hot water from a spring of current Oita Prefecture and let Sukunahiko bathe. After that, Sukunahiko came back to life soon and stood up and danced for joy on a rock and left his footprint on the rock. You can see this rock on the northern side of the main building. 「이요국풍토기」에는　두 신의 전해져오는 이야기가 있는데, 오오쿠니 누시노미코가 중병의 스쿠나히코 나노미코토를 구하기 위해 오이타의 하야미 온천을 끌어다가 목욕을 시 켰습니다. 목욕후, 신기하게도 되살아난 스쿠나히코 나노미코토가 일어나 춤을 추며 밟은 돌에 발자국이 남았다는 전설이 전해지고 있습니다. In 596, Prince Shotoku visited the onsen of Iyo. He was impressed with spiritual atmosphere of the onsen. After soaking, he made a poem. In his poem, he admired that the onsen was blessed with plenty of camellia trees and made him feel like being in the heaven. Now, the camellia has been registered as the City Flower since 1972. 법흥육년(596), 이요온천을 방문한 쇼토쿠태자는 영묘한 온천의 감동을 기억하기위해 비문일수를 만들었습니다. 당시의 온천마을은 동백꽃이 풍부하게 우겨져, 마치 극락에 있다는 생각이 들어졌다고 일컬어져 있습니다. 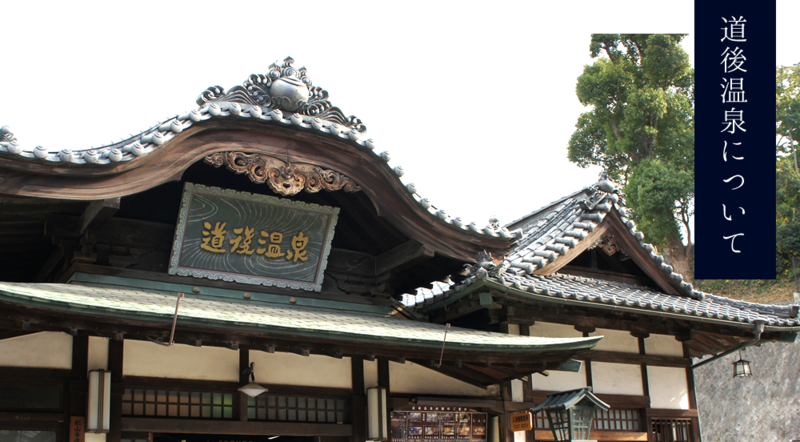 In 1890, Isaniwa Yukiya, the first mayor of Dogo, tried to rebuild the damaged Dogo Onsen main building. But his plan was opposed by his colleagues and many citizens at first, and even his life was threatened. But he tried to accomplish his plan even if he sacrificed his own salary. Eventually he succeeded to persuade the village people with his whole heart declaring that the main building must be the one unprecedented and no one can challenge to imitate even after 100 years later. Further, he stressed that if tourists visit here and spend money, the locals profit as a result. The building was three-storied wooden structure which was rare at that time. He also projected new railway transportation system to Dogo area and established the Dogo Railroad Company. The company built light-weight railroad from Ichiban-cho streets to Dogo and from Dogo to Mitsuguchi area. In those days, a sea route from Kansai area was opened and Dogo area began to prosper by having many tourists from outside Matsuyama. His tomb is located in Sagidani graveyard from where you can command a great view of Dogo onsen downtown. 메이지 23년(1890) 도고의 초대촌장인 이자니와 유키야는 노후화되었던 도고온천본관을 개축하기 위하여 많은 힘을 쏟아부었습니다. 당시 외부의 많은 반응과 비판, 생명의 위협,　임부들 모두 스스로 임금을 받지 않고 처음에 정한 목표를 이어나갔습니다. 그 결과, 100년 지나도 흉내낼 수 없는 건물을 지었다는 의미와 방문하는 사람이 늘어 마을이 윤택해지고, 백성과 장인의 생활도 좋아짐과 성심성의껏 주민을 설득하여 이 위업을 이뤘다는 것입니다. 동량은 성의 목수 사카모토 마타하치로를 기용해, 당시에도 드물었던 목조 삼층 누각이 제작되었습니다. 또한 도고에 철도를 인입해 도고철도주식회사를 설립, 이치반쵸~도고, 도고~미츠하마쿠치 사이에 경편철도를 설치하거나 간사이에서의 항로가 생기는 등 도고 온천이 발전하게 된 시절이라고 할 수 있습니다. 이자니와 유키야의 무덤은 도고온천가를 내려다보는 사기다니에 묘지가 있습니다. 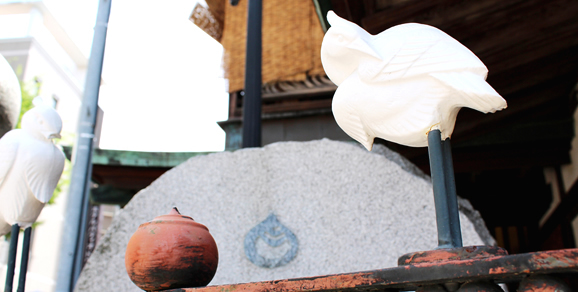 The white heron watchtower is located on top of the third floor of Dogo onsen main building. The small area is encircled with sliding glass doors. At night, a lamp hung from the center of the celling was lit to illuminate outside. In those days, there was no neon illumination so the light specially stood out in the night sky of bustling streets. In addition, a drum kept inside the tower was used to announce the time every an hour. At present, the drum is beaten at 6 am, noon and 6 pm. The sound of the drum has been selected as “one of the 100 sound-sceneries to be preserved” by the Ministry of the Environment. 본관3층의 옥상에 설치되어있는 신로각은 과거에 약 1평의 주위에 빨간　기야만 미닫이에서 밤이되면 중앙 천장에서 매달은 조명을 밝히고있었습니다. 그때는 네온조명이 없어 온천마을의 밤하늘에 이채로웠다고 합니다. 또한 중앙에 매달아 북은 옛날부터 시간을 알리는 북으로 1 시간마다 울려지고 있었습니다만 현재는 아침 점심 저녁 3 번 울려 있습니다. 이 북은 환경청의 남기고 싶은 일본의 소리 풍경 100 선에 선정되어 있습니다. In Kami-no-Yu, there are two types of rooms, on the first and second floor. The lounging room on 2nd floor is different from Tama-no-Yu, and a rental towel, yukata, tea and a rice cracker are served. The 1st floor facility has no place to rest but you can enjoy bathing here. You use the same bath when you take the 2nd lounging room. 카미노유는 2층의 휴게실과 아래층의 목용탕으로 나뉘어집니다. 2 층의 휴게소는 타마노유와 별도로 큰객실에서 대여 타올, 유카타, 차, 과자가 함께 나옵니다. 1층에는 휴게소가 없지만, 도고의 온천을 마음껏 즐기실 수 있습니다. 목욕은 카미노유 2층과 아래층은 같은 욕실입니다. In Tama-no-Yu, there are two types of rooms, private rooms on the 3rd floor and a lounging room on the 2nd floor. The users of the 3rd floor private rooms share bathroom with the users of 2nd floor lounging room. You are served with a rental towel, yukata, tea and a Japanese cake. The 2nd floor room is more spacious, so you can enjoy tea after bath in an open atmosphere. 타마노유는 3층개인실과 2층 휴게실으로 나뉘어져 있습니다. 3층 개인실은 휴게실이 개인실로 되어있어, 욕실은 2층 휴게실과 같은 타마노유를 이용하게 됩니다. 대여 타올, 유카타, 차, 과자가 나오며 2층 휴게실(카미노유 2층 휴게실과는 다른 장소)은 아주 큰방이며 개인실과는 다른 개방감 속에서 목욕 후의 차(茶)도 별미입니다. 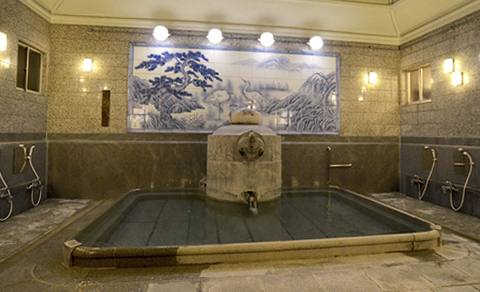 Yushinden was built in 1899 as a bath exclusively for the Japanese imperial family. 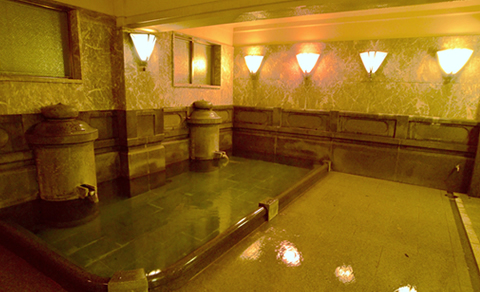 Emperor Showa visited the bath in 1950. It features the elegant style of Momoyama architecture. The surface of tatami mats is Bingo style and the hem is Korean style. Wickerwork is decorated on transoms. The ceiling is made of three Korean style paulownia layers and sliding doors are decorated with gold leaf. The furniture is made of best lacquerware and deformation due to aging is minimized. 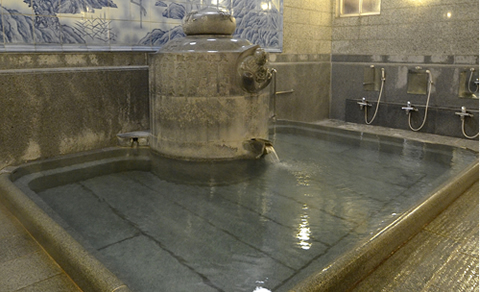 The bath was made of best marble produced in Kagawa Prefecture and its water tank has a precious orb which is inscribed with images of Okuninushi-no-mikoto and Sukunahiko-no-mikoto deities. 유신덴은 메이지 32년(1889)에 지어진 황실전용의 욕실입니다. 쇼와천왕은 메이지 25년(1950)에 목욕을 했었습니다. 건축 양식은 모모야마시대 풍의 우아한 풍으로, 다다미는 빙고국(현재 히로시마현)표의 고려연, 통풍 공간의 콩새와 밀화부리가 투각되었으며, 천장은 고려의 오동나무 세 장으로 장식되어있고, 맹장지는 금박과 극채색의 국화가 그려져있어 호화롭고 아릅답습니다. 또한 모든 창호는 최고급 옻칠을 이용한 와지마 칠기로 장식되어며, 현재까지 건축 이후로 한 번도 망가지지 않은 훌륭한 건축물입니다. 욕조는 화강암 중에서도 최고불려지는 카가와의 ‘아지이시’이며, 정면에는 탕가마에 오오쿠니 누시노미코와 스쿠나히코 나노미코토 두신을 새긴 보주가 있습니다. Alkaline spring water is perfect for smoothing the skin of guests and it is suitable for spa cure and beauty. Many celebrities including Prince Shotoku, Natsume Soseki, Masaoka Shiki had visited here. Today, 19 wells out of 29 hot spring sources are registered to Ehime prefecture. Currently the water is pumped up from 18 wells. One well is out of use due to aging. The temperature is from 20 to 55 degrees Celsius. The water is transported to four tanks through underground piping and distributed to Dogo onsen main building, Tsubaki-no-Yu, nearby hotels and ryokans. 알칼리성 단순천의 탕질은 섬세한 일본인의 피부에 딱 맞는 매끄러운 물로써 치료나 미용에 적합합니다. 쇼토쿠태자부터 나츠메 소세키, 마사오카 시키 등 많은 문인묵객들이 방문하였으며 원천 29개 중, 현재에도 19 개가 에히메 현에 등록되어 있습니다. 1개는 시설의 노후화때문에 휴업을 하고 있지만 남은 18개 업소에 온천을 퍼 올리고 있습니다. 온천은 최저온도가 20℃, 최고온도가 55℃정도입니다. 또한 각 원천부터 지하에 매설한 송유관에서 4개소의 나눠진 온천에 모은 물을 도고온천본관・츠바키노유, 주변의 호텔・여관에 배탕하고 있습니다.